Hello friends. I have a special post to share with you today! 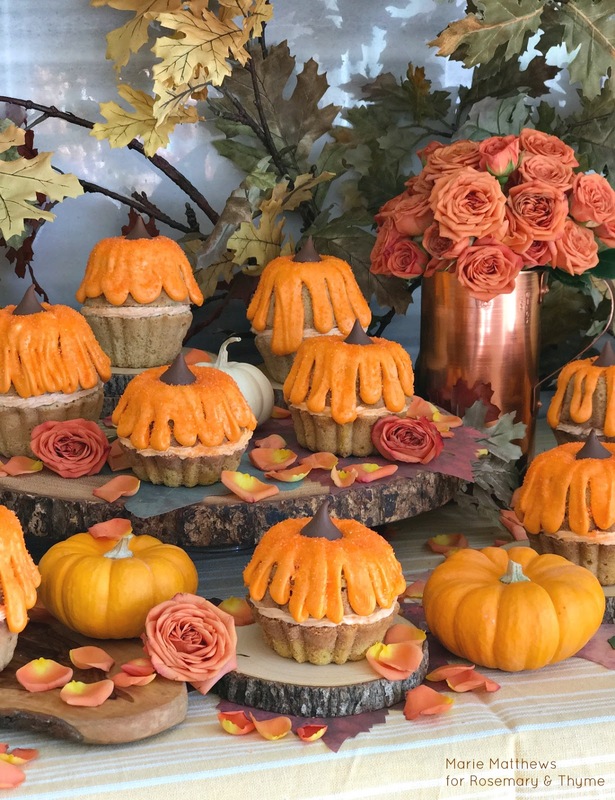 I am thrilled and extremely honored to have a special friend joining me on the blog today to bring you a fun and delicious Pumpkin Cake Recipe. Let me introduce you to Marie Matthews. 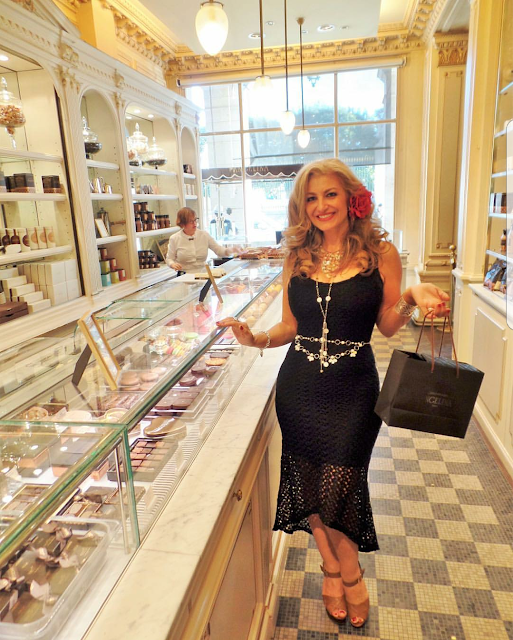 A Southern California girl who is a makeup artist in the entertainment industry who also majored in English Literature. How fabulous is she!!! Marie and I connected through Instagram which is where she shares all of her amazing recipes and tips for entertaining. One of the many positive things about our internet world, is being able to meet and work with talented people who share our same passions. Individuals with creative minds and amazing commitment to following their dreams. People that support each other and bring positive energy to your soul. And Marie is undoubtedly one of those people for me. Two of the many passions that brought us together were our love for entertaining and setting a pretty table. And let me tell you, this pretty girl has skills. She can bake and cook too. 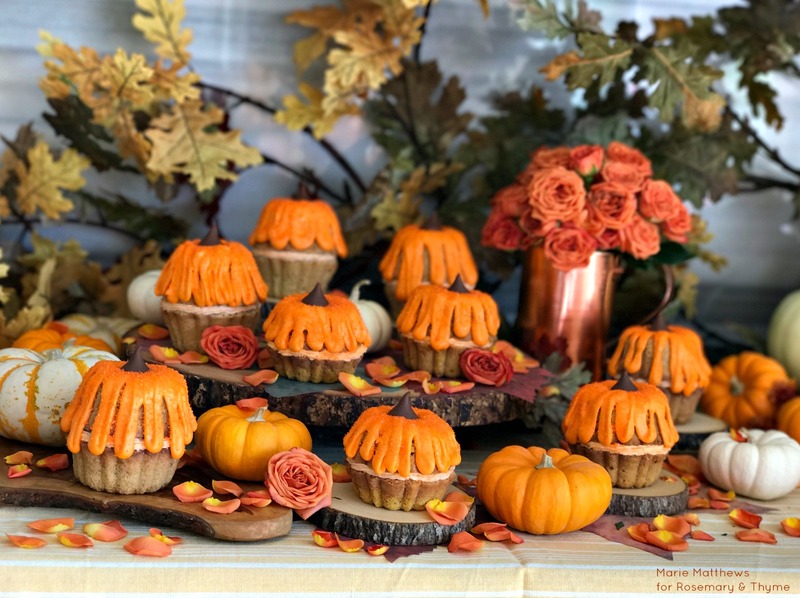 So today, I am excited to bring you Marie's recipe for "Mini Pumpkin Cakes". And these little cakes are gorgeous!!! I was truly blown away when she sent me her photos. She really did an magnificent job decorating and styling these mini cakes for us. Her photos are phenomenal. 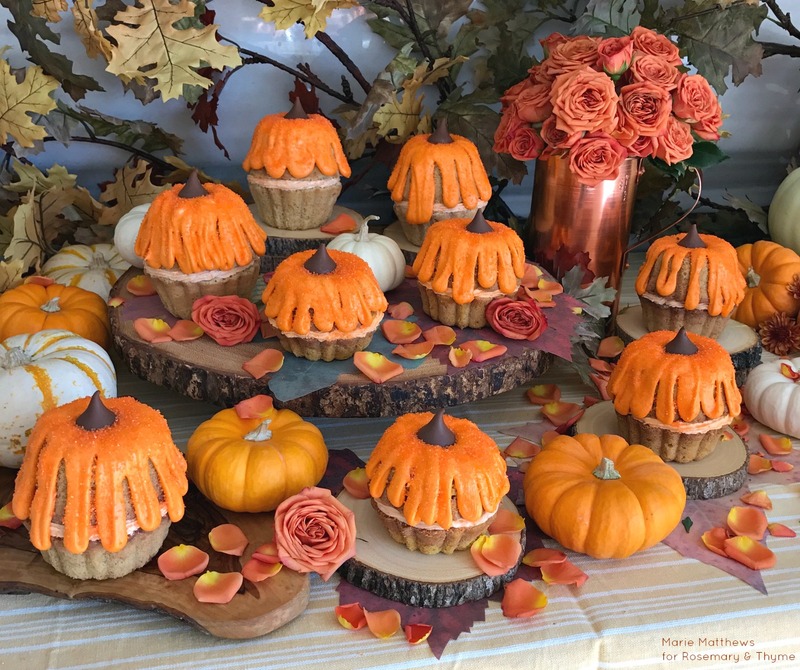 Can you imagine these beautiful cakes dressing your next fall inspired dinner party or Thanksgiving table?. They will definitely steal the show! What says fall more than glorious foliage colors and pumpkins? 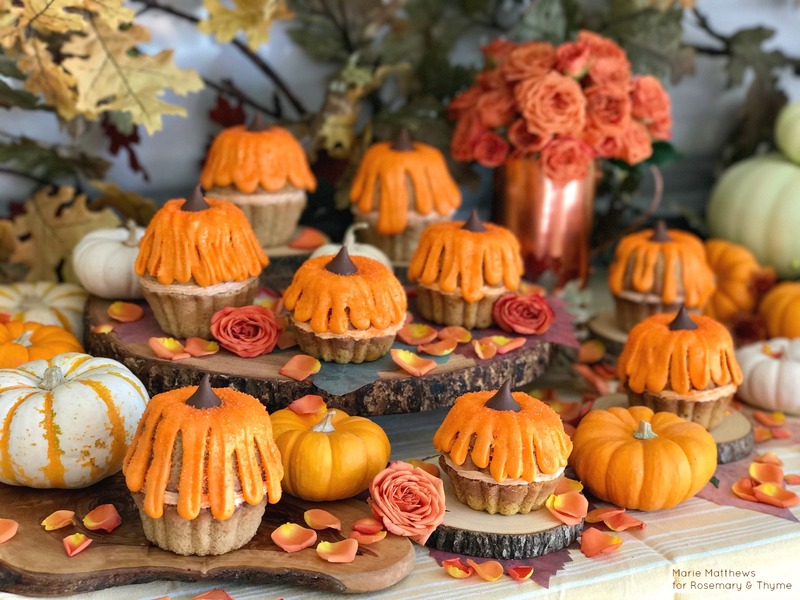 In Southern California, where I live, we don't get much of the fall season, so I invite fall into my home with lots of fall decor and baking fall desserts. 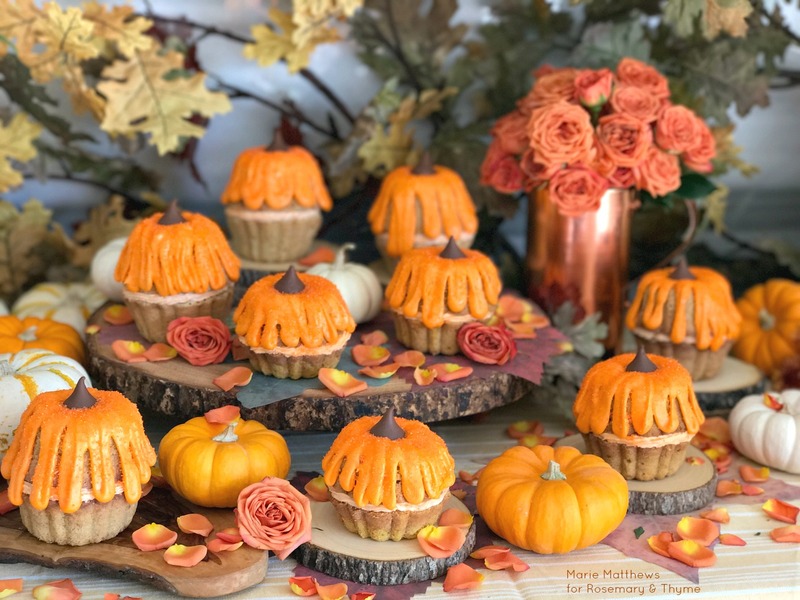 There is never a shortage of pumpkins here, so I celebrate everything pumpkin and spice, and fall has never tasted and smelled as good as with this yummy autumn dessert that's as adorable as it tastes! I know fall has arrived at my home when this cake is in the oven and permeates my entire house with its intoxicating cinnamon and spice aroma. I hope it will become a favorite of yours as much as it is mine! Happy Fall baking! Add the egg yolks one at a time and mix to incorporate between additions, and add vanilla. Also be sure to stop the mixer to scrape the bottom and sides of the bowl to incorporate well. Add the sifted dry ingredients (flour, baking powder, salt & spices) all at once and blend to combine but don't overmix. Reserve batter while whipping egg whites with the second measure of 1/4 cup sugar to medium firm peaks. Fold the meringue into the pumpkin batter carefully not to deflate batter, then pour into prepared pans. Bake immediately in preheated 350°F oven for approximately 20-25 minutes, (cakes are done when the sides of the cakes just start to pull away from the pan, and a wood skewer inserted into centers comes out clean). I added a touch of orange food color and a dash of pumpkin pie spice (optional). In a stand mixer fitted with the whisk attachment or using an electric hand mixer whip the butter until light and creamy for about 7-8 minutes on medium/high speed. Once the butter is pale in color and light slowly add in the confectioners' sugar one spoon at a time on medium speed. Let the sugar fully incorporate before adding in more sugar. Add the vanilla extract, vanilla bean seeds, salt and cream. Whip on high speed for another 3-4 minutes until very light, creamy, and fluffy. Add orange food color or pumpkin spice flavored extract if desired. Use the buttercream straight away for keep it refrigerated for upto 4 weeks. Before use make sure it comes to room temperature. You may pipe the frosting for a ruffled edge or spoon it on. 1/4 - 1/2 cup heavy cream, milk, or water (it is your preference). Combine the confectioners sugar and cream or milk and whisk smooth, add orange color. Pipe onto the tops of the Bundt cakes or drizzle with spoon. *You can make this pumpkin cake in a round cake pan if you don't want to fuss making these pumpkin shaped cakes. Give it an extra 5-10 baking time. This recipe will make 2 x 8" layers that can be sliced into 4 layers if desired. It is a delicious and moist pumpkin cake regardless of shape. *You can also use your favorite pumpkin cake mix for making these pumpkin cakes. One cake mix should make about 6 mini Bundt cakes. *I have the best luck by preparing my Bundt pans by using a pastry brush, brush on a combination of solid shortening and a little coconut oil together. Dust with flour. Make sure all crevices are covered, especially the center cone. Instead of flour, you could use a little of your dry cake mix. *Fill batter into Bundt cake pans leaving enough space to rise. *Cakes can be frozen (without buttercream filling and icing) for up to 2 months well wrapped. Thank you for stopping by today and happy baking. Too pretty to eat , thanks for sharing them and the recipe with us. I agree Sylvia. 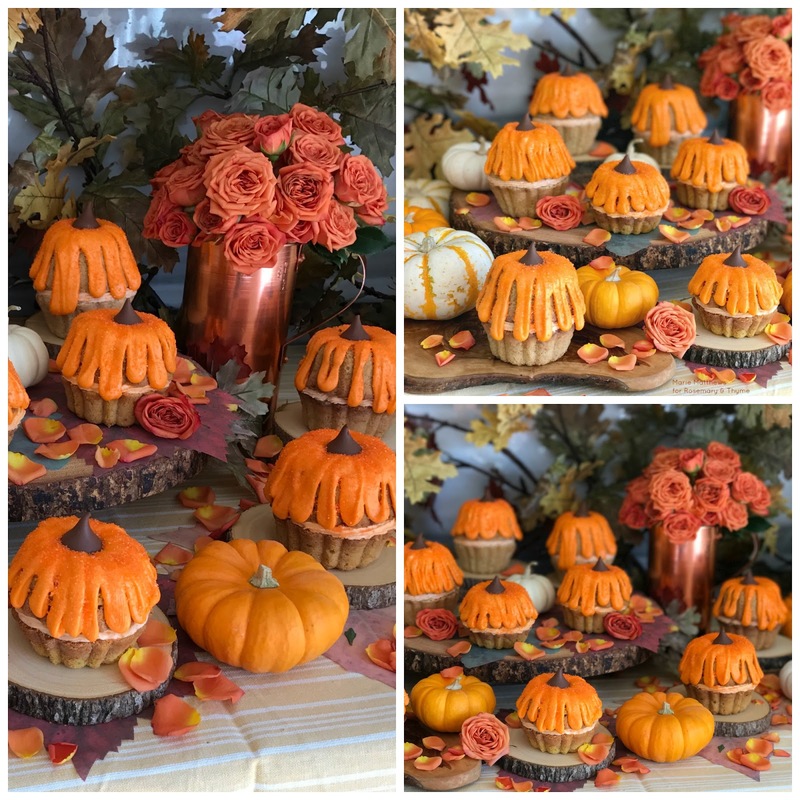 These little pumpkin cakes are gorgeous. My pleasure to share. I agree Cindy. 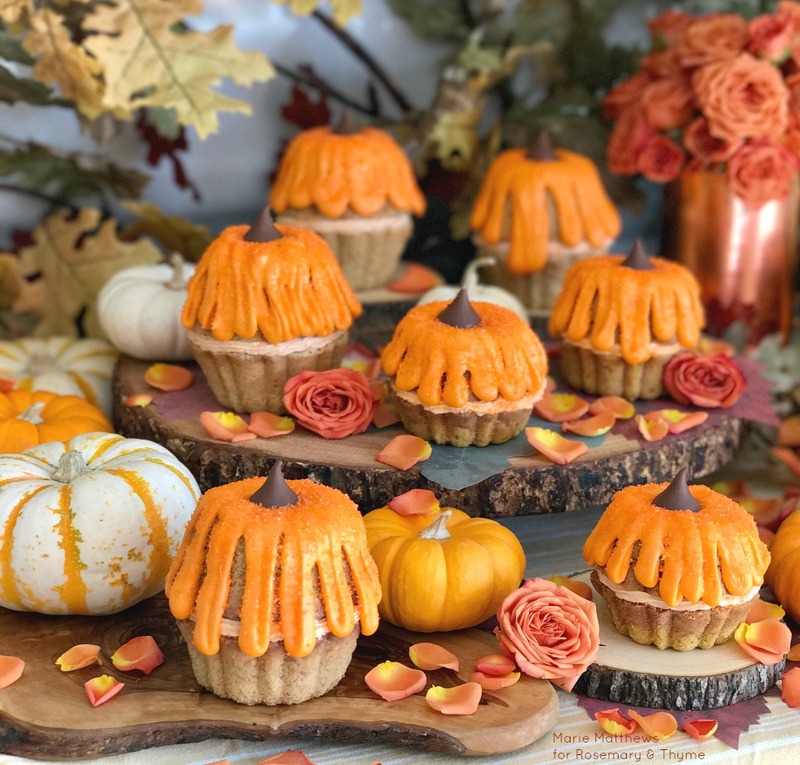 These little pumpkin cakes are gorgeous. It is my pleasure to share the recipe with you all. Oh, my! There are 206 bones in the human body. Marie is made up of 206 of the most creative bones God had in his workshop! Her creative skills are boundless! Not just a pretty face by a long shot! Thanks for sharing her incredible talents! You are too funny. I do have to agree though. Marie is extremely talented and I am so happy she shared this recipe with us all. I hope you are enjoying autumn so far. This is the time of the year that I love to bake and I will be trying these. Thank you for sharing. Me too. Fall is my favorite time for baking. Please do. I hope you give this recipe a try. It is my pleasure to share the recipe with you all. Thank you so much Angela. I hope you are having a wonderful autumn. These are almost too pretty to eat! What an amazingly talented gal she is. Thanks for sharing with SYC.